What happened to Rosemira’s Bella Rose Anti-Wrinkle Cream? Many people mistakenly contacted me to purchase the cream. I researched and found out that Christie Brinkley indeed has a skincare line, but that she wasn’t associated in any way with the company advertising the Bella Rose RX scam, even though their advertising showed her name and picture pointing to a line of products. The use of the name didn’t bother me much. What ticked me off was that my company’s name and product would be confused with that unsavory cream. I couldn’t find a list of ingredients, but one of their clients who called to complain about the Bella Rose RX shipment she received, was kind enough and tried to read the list of ingredients on the box. The print was too small even when she used her glasses. The partial list of ingredients included Propylene Glycol – a drying and irritating alcohol to anyone with even slightly sensitive skin; Paraffinum liquidum- a form of Mineral oil, a Petroleum product, and one of the worst oils to use in skincare formulations; a synthetic version of a peptide, called Palmitoyl Oligopeptide; Palmitoyl Triceptide-7- a latex polymer; the Hydrolyzed Vegetable Protein PG-propyl Silanetriol- A silicone-derived synthetic ingredient. Where are the natural ingredients advertised? I’m still waiting. What does this even mean? Even the language is poor. Natural ingredients have nothing to do with the ones in the above list. Here’s the list of Organic ingredients in my Bella Rose Anti-Wrinkle Cream: Jojoba Oil, Aloe Vera Gel, Lanolin, Yellow Beeswax, Distilled Water, Turkish Rose Otto Essential Oil, Italian Neroli Essential Oil, Indonesian Patchouli Essential Oil, French Rose de Mai Essential Oil. A list of ingredients you can spell and pronounce. How many ingredients do you need to put in your stew or your salad? if you don’t eat processed foods, your list of ingredients is short and simple. Sometimes we use more exotic ingredients, and some of the formulas are quite complex, but our ingredients are always plant based, natural and either organic or wild-crafted. So, that’s my rant for today. I cannot stress enough – do not purchase anything online unless the complete list of ingredients is disclosed. When they’re not, there’s no transparency- they don’t want you to see the list of ingredients. Our skin is our body’s most important organ of absorption. Whatever we put on our skin is absorbed into our blood stream and cells. The results of using toxic products on our skin is dangerous and worsens with time. Feed your skin a good diet and it’ll reward you with healthy and attractive results. 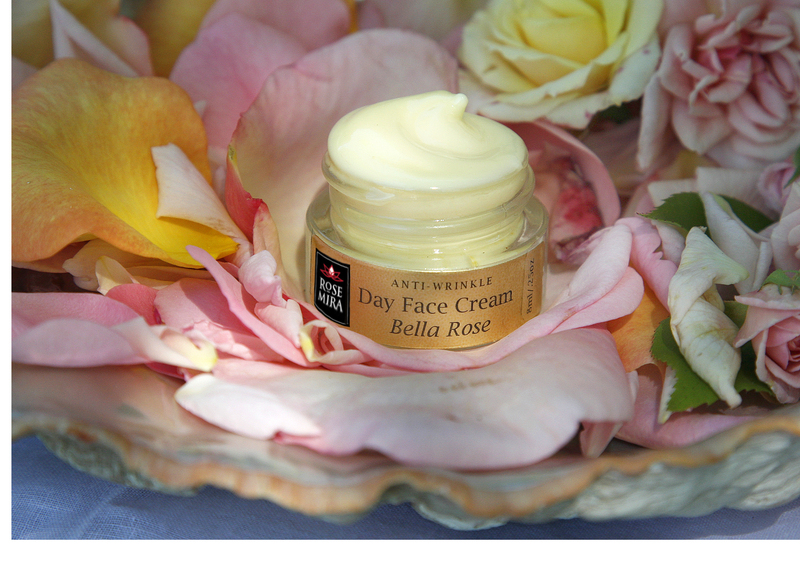 “The Bella Rose Anti-Wrinkle Cream is so wonderful! It is very rich and thick, but after it is applied (sparingly!) it has an incredibly light and airy feel on the face. It also has a beautiful Rose aroma, not overpowering at all. I definitely recommend it for older women, but also for younger women who want to get a head start in prolonging their beautiful, youthful skin.” – Stella P.
This entry was posted in Uncategorized by rosemiraorganics. Bookmark the permalink. Good evening Mira, I am leaving town on the 18th of August. For 10 days. If it can’t get here before I leaving please wait till I get back on Monday the 28th of August. Thank you. Tracy pilacelli.